If you’d like to OPT-OUT of receiving a physical newsletter by mail, please click here. Spring is in full bloom and so are the projects in Waterleaf Falls. The pool has been replastered and will be ready for our season opening on May 2nd, so find your access cards from last season and join us for a dip! New chairs, tables, and loungers have been ordered and we’ve even repaired some existing furniture to save funds. Our marquee signs have been relocated for easier viewing. We are looking for improvement ideas to make our amenities more appealing, like a cover for the playscape. Our governing documents are currently under review by the newly formed task force and we hope to have some needed changes coming in the future that should benefit all. Please check out our committee pages for updates on events happening this month. Submit your pick for Yard of the Month, attend a Neighborhood Watch sponsored BBQ in the Park on May 2nd, or splash in pool, clean out your garage on the 16th with the rescheduled community garage sale, or help our furry friends at PAWS with a donation drive including pet-chipping for your pets, homemade treats, and ways for us to help our local shelter on the 23rd. We have a very active month ahead and we want to see you out and about! 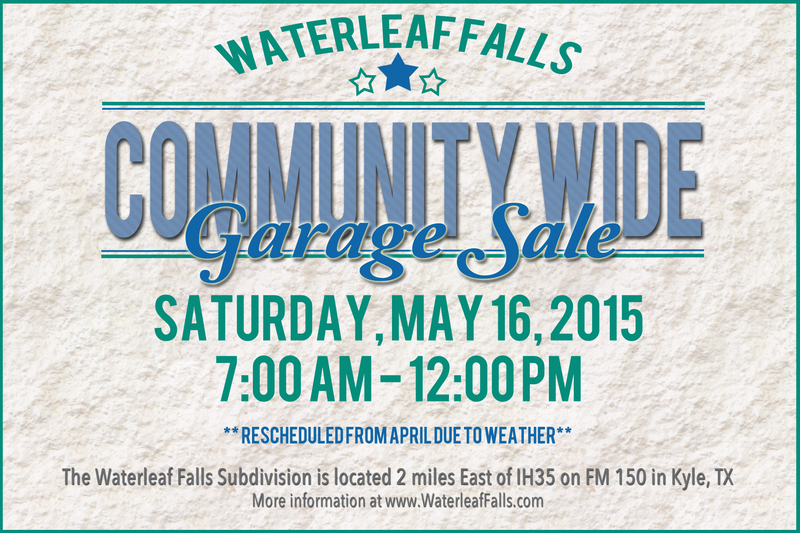 We need your help to make Waterleaf Falls the best neighborhood in Kyle. Volunteer to be a Block Captain today! The HOA Board will have a Core Meeting at the Park Pavilion on Thursday, May 7th at 7pm. Please come out and meet us as we would love to hear your ideas and concerns. There are only a few lots left in our beautiful community, so it is very important for everyone to be as active as they can. With lots of remarkable work being done all around the subdivision, by all of our committees, we would absolutely LOVE to see everyone participate in meeting and/or events, as your schedule permits. Please do not hesitate to contact us at any time with any ideas, concerns, or questions and we hope you all have a great month. The weather prevented many of our neighbors from participating in last month’s community garage sale, so the event has been rescheduled. We are thrilled that so many did have success, but would like to allow everyone the opportunity to participate. So, clean out your garages and set up shop on May 16th! We will again advertise on multiple sites to guarantee you some good foot traffic and great sales! 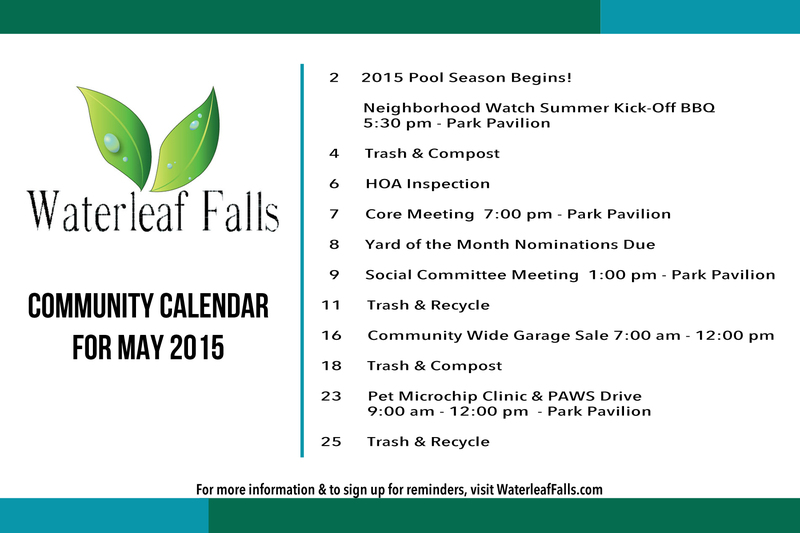 Waterleaf Pool Opens May 2!! – The pool will be open on Memorial Day (May 25) and then begin the regular schedule for summer. – Pool is CLOSED every Monday for cleaning. Must be a resident member and/or guest of a resident member. Must be current on all fees. Fees must be paid in full ten (10) days prior to issuance of the key card or currently on a payment plan for new season activation. Must have a key card to enter facility. The Pool and Park Pavilions are available to reserve for parties and get-togethers. In order to host an event at either the pool or park pavilions you must be in good standing with the HOA. The Pool Pavilion can hold up to 20 people and guests must follow all pool rules. The Park Pavilion does NOT have a maximum occupancy. Please keep in mind that park parties may not go in and out of the pool and pool parties must stay inside the gates of the pool area. – Visit the Pool Info page at WaterleafFalls.com and click on the Pool Info tab to fill out the form to check if the pool is available. – After you have made contact with the Pool Committee, download the Pool/Park agreement form. Your party will be placed on the calendar and you will receive an e-mail to confirm your reservation. Have fun and enjoy the facilities! Please clean-up after the function and return it to the way it was prior to the function. Obey the lifeguards at all times. Lifeguards are authorized to enforce these rules including ejection of non-compliant residents and guests. PARENTS ARE DIRECTLY RESPONSIBLE FOR THE ACTIONS OF THEIR CHILDREN. Children under 14 years of age must be accompanied by a resident 18 years or older and must stay within an arms reach. Residents 18 years or older may supervise a maximum of four (4) children under the age of 14. Parents/Guardians may supervise all children living in their household. All guests must be accompanied by a resident who remains at the pool during the guest’s visit. One resident may host a maximum of 4 guests subject to the restrictions of rule #2. Lifeguards are authorized to refuse entrance to resident’s without a key card. Key cards will not be given to non-residents. Absolutely no running or rough play at any time (throwing each other, pushing, dunking, getting on another’s shoulders, splash fights, or dog fights). Anyone exhibiting this type of behavior will be asked to leave the pool area. Diving, flipping or unsafe jumping from the side of the pool is prohibited. Tobacco products or chewing gum in pool is prohibited. No glass containers or alcoholic beverages allowed in the pool area unless at a function the Board of Directors has previously approved. Food and drinks are allowed in the sitting area only. Only water in plastic containers will be allowed on the deck area. ABSOLUTELY no food allowed on the deck or in the pool area. No littering. Please use trash receptacles provided in the pool area. Recreational flotation devices are allowed at the lifeguards discretion based on pool occupancy. Safety flotation devices allowed include noodles, kickboards, arm floats and toddler life preservers. No offensive language or loud, profane, vulgar or otherwise offensive music. Swimmers in the water have the right of way. Those entering the water must make certain no one is in front of them. No bikes, razors, skateboards or motorized vehicles with the exception of handicapped scooters inside the pool area. Proper swimming attire is required. Cut-off jeans and street clothes are not allowed in the pool. Plain t-shirts are allowed to be worn over swim wear. Children under 3 years of age must wear appropriate swim wear (swim diapers). The use of cocoa butter, baby oil and other heavy suntan oils cause filter damage. Use these lotions sparingly. No swimming after designated swimming hours. Anyone caught swimming after hours will have their key card deactivated for the remainder of the pool season and have trespassing charges filed against him or her. Swimming with an open sore or communicable disease is prohibited. Only the lifeguards are allowed on the stands. They have the authority to remove from the pool area anyone disobeying the rules or endangering the safety of themselves or another person. The lifeguard has the authority to suspend offender for one day. Additional violations will be turned over to the Board of Directors. Repeat violations may result in revocation of swimming privileges for the remainder of the summer. YOU MUST HAVE YOUR KEY CARD TO ENTER THE POOL AREA. OPENING THE GATE FOR ANYONE WITHOUT A KEY CARD WILL RESULT IN THE LOSS OF YOUR PRIVILEGES FOR THE REST OF THE POOL SEASON. The gates are to remain locked at all times. Under no circumstances should the gate be propped open without the permission of amenities staff. 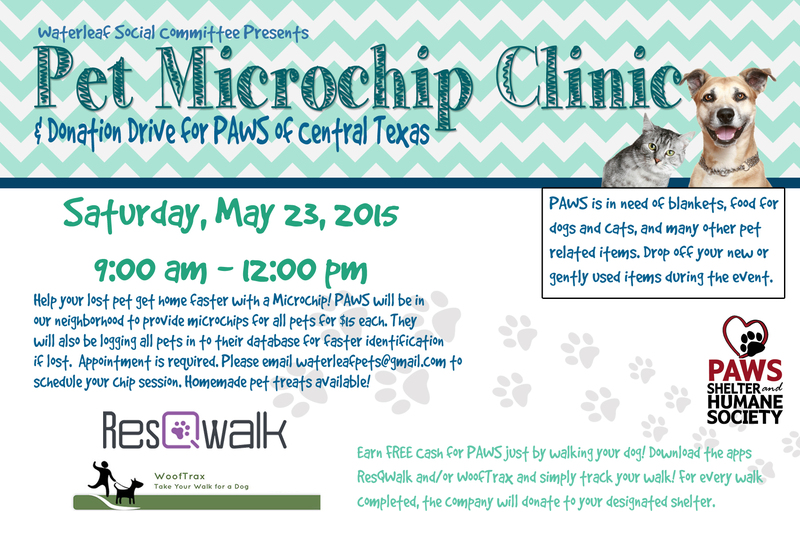 Mark your calendars! Friday, May 1st is Kindergarten Registration! The Tobias Elementary office will be open from 8:00 am-4:30 pm. The end of school is getting close! Have you made your summer plans yet?! If not, here are some fun ideas to keep your kids busy. OHG’s Summer Camp is open to members and non-members ages 5 -12. Offered Mon-Fri 7:30 am – 6 pm all summer long! Enroll for a week, a day or even a half-day! Our flexibility helps you get the most out of your camp budget! Campers will enjoy gymnastics, field trips, swimming, arts/crafts, weekly themes, games and more! There are MANY more options, but here are just a few to get you started! Join us the second Saturday of each month for local vendors, arts & crafts, farm to market items, live music and much more! May 9th’s theme is “Keeping it Kyle” Support local business! Movies begin 30 minutes after sunset and are shown at the amphitheater at Lake Kyle. Bring your own lawn chairs, blankets and snakcs. The first movie of the season is Big Hero 6! All residents are encouraged to attend and meet your new resident board members as we discuss and vote on our ideas to better our community. We’ll be discussing our June and July events, as well as, brainstorming ideas for future events! Your new Social Committee Chairs are as follows Stacy Vail, Wendy Hebert, and Megan Warren. We would love more volunteers in the neighborhood. We have over 900 homes and only a few people planning events on a regular basis. Fresh faces bring fresh ideas and new ways to bring the community together! 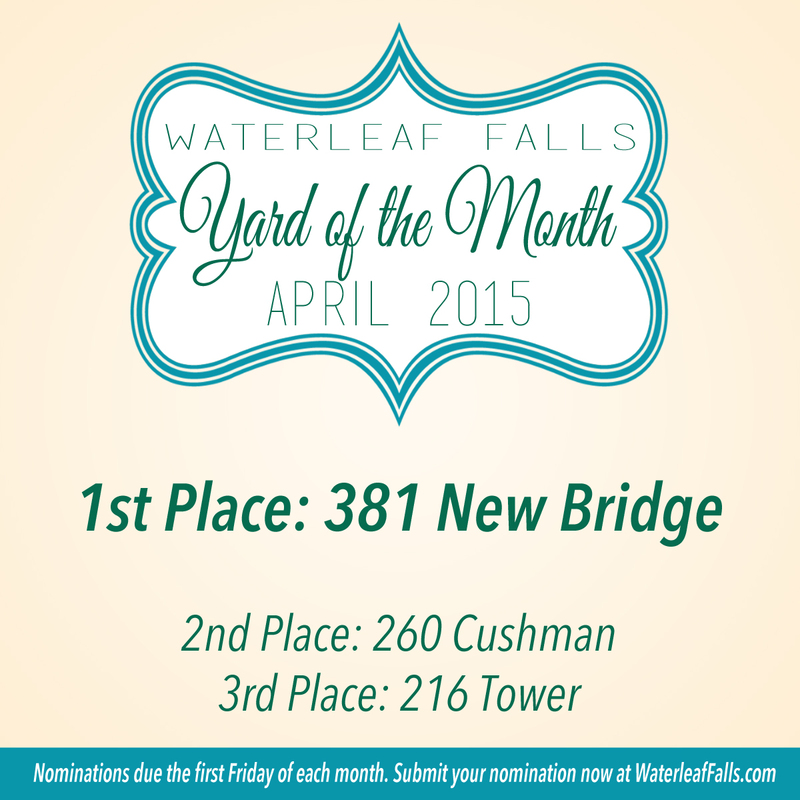 Congratulations to our April Yard of the Month Winners! May nominations are due Friday, May 8! Nominate now with our online form! 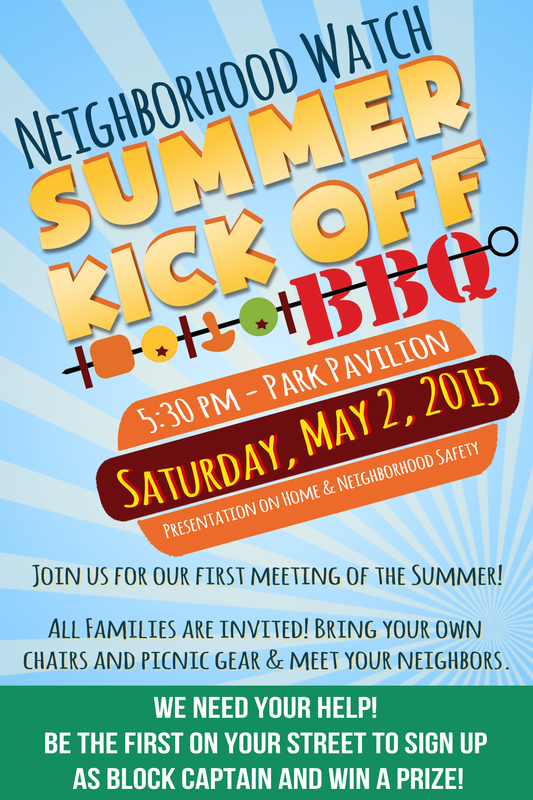 Neighborhood Watch is once again revamping and we need you! We will combine our efforts with the Social Committee and make this years goal to get neighbors out meeting each other. Your involvement is welcome, needed and appreciated by both committees. Let us know your ideas/ suggestions! For the month of May we are asking anyone to volunteer as Committee Chairs and Block Captains. Committee Chairs are those who would like an active part in planning and carrying out our duties for events and meetings. We need 1 to 3 people to join us. You can email us your interest or let us know at the BBQ! Block Captains, this group will be the liaison on your street to help with communication between the two committees. It would be great to have one block captain to every 10 to 15 houses. Your job is to be open to neighbors who may have something to say to the committees, or you may have info to forward via a note card given by the committees. Very simple but so important for all of us! So with this in mind time for a contest! READY – SET – GO! Be the first to sign up for your street and win a prize! Upcoming events- mark your calendars! June 3 – Sidewalk Coloring, get your family and chalk out front and get some art on the sidewalks! Imagination – please create a safety message/design. Then take a walk through the neighborhood and enjoy. Meet some neighbors! July 4 – neighborhood parade and NW first annual Stars and Stripes Yard Award. Prize given for most patriotic yard display. Watch for details in June newsletter. The neighborhood has been quiet this past month in terms of incidents. But please remember, the warm weather brings many outside. Slow down on the roads, keep eyes open for all using the sidewalks and streets. Keep our pets on leashes. Lights on out front in the evenings. If you have not already done so, you can subscribe to receive e-mail updates from our website, simply by entering your email address in the box on the right hand side of the webpage. We will send you updates to be reminded of upcoming meetings and events. This is also the official method of communication for the board, so updates regarding improvements or other issues will be posted here. You will not be flooded with e-mails or spammed from the website. ← The Governing Documents Taskforce needs YOUR help!